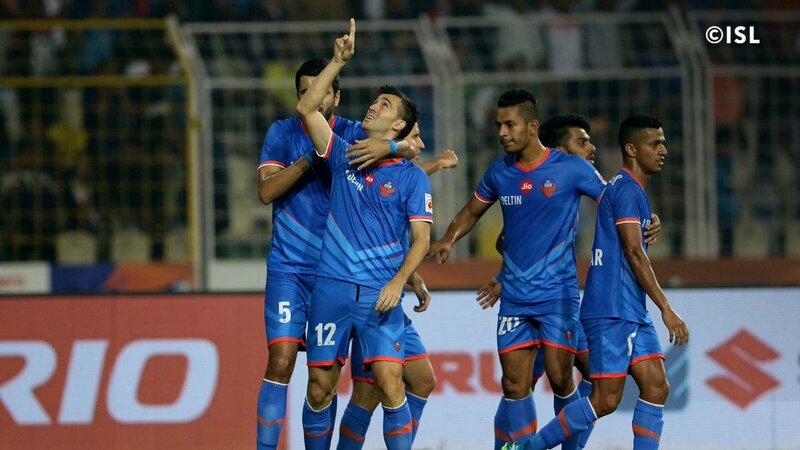 Fatorda (Goa), Dec 10: FC Goa thrashed Kerala Blasters 5-2 in their Hero Indian Super League (ISL) clash at the Fatorda Stadium here on Saturday. Mark Sifneos opened the scoring on the night for visitors but Ferran Corominas's second successive hat-trick in the ISL took the game away from Kerala Blasters. Manuel Lanzarote also continued his good form for Goa by scoring two goals. Jackichand Singh was the only other Kerala player to get on the scoresheet. Kerala Blasters had an unfortunate start to the game. The visitors' marquee player Dimitar Berbatov had to be taken off due to injury in the fourth minute of the game. But that didn't seem to have any effect on Rene Muelesteen's side who opened the scoring in the seventh minute. Jackichand's pinpoint cross into the box from the right wing found Sifneos and the Dutch striker's shot crept under FC Goa goalkeeper Laxmikant Kattimani into the goal. Lanzarote levelled the score for Goa with a side-footed volley two minutes later. The Spanish import then handed the home side the lead in the 18th minute of the game. Some sloppy play at the back by Kerala Blasters goalkeeper Paul Rachubka gave Lanzarote an opportunity to have a go at the goal and he obliged with some style and precision. FC Goa, however, couldn't hold on to the lead for long. Jackichand equalised for Kerala at the half-hour mark after some one-touch play on the edge of the box between him and Milan Singh opened up Goa's defence. Both sides went in the half-time with the scoreboard reading 2-2. In the second half, it was the Coro show. Having scored a hat-trick in the previous game, FC Goa's Spanish forward followed that up with another hat-trick in just seven minutes to take the game away from Kerala Blasters. Just three minutes into the second half, Ahmed Jahouh's through ball put Coro clear on goal, and the in-form striker slid past Rachubka to restore Goa's lead. Two minutes later, Kerala's defence was opened up again thanks to a similar move. This time, Pekuson put the ball through and Coro lifted in over the goalkeeper to double the home side's lead. Muelesteen's side looked shell-shocked and their defence was breached again in the 55th minute. Lanzarote's low cross from the right was turned in by Coro who duly completed his hat-trick.